Footballwood presents you the all new Arsenal 2015-16 away kits for the new season. The gunners will be seen in completely different look as their kit manufacturer Puma has experimented lot of things on their jersey and shorts. Few weeks ago, we provided you the leaked Arsenal 2015-16 kits and this time you can take a look on the all new away kits of the Gunners. Not only jersey, the away shorts and socks of the club developed by Puma are also available here. A picture of some Arsenal players wearing these new kits is also inserted. So just scroll down this page and take close look on new kits of AFC. Jersey: The all new away jersey of Arsenal football club is mainly developed with golden and blue appearance. Interesting thing is, golden rhombus shaped patterns are available at the front and at the back of t-shirt which might give you similar look of Leicester City 2015-16 away kit. Collar is blue in physical look. Below collar, there is a V-shaped triangle that is looking pretty attractive. At the front, club’s crest is on left chest whereas trademark logo of Puma is on right side in blue. As usual, the sponsor logo of “Fly Emirates” is printed at the center. 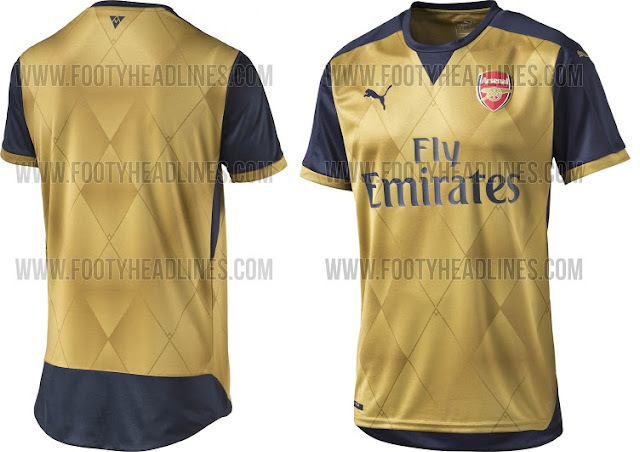 Arms of Arsenal 2015-16 away jersey are in blue look on which golden Puma logo. Sleeves are provided with golden rounds at the end of arms which is also looking incredible. Some more elements are available in the form of an inset on the sides and the triangle heritage badge on the upper back below the collar. Nice job by Puma! Shorts and Socks: Talking about shorts, these are almost navy blue in appearance. There are minor elements in golden like a single wide stripe at the end of shorts. Socks of Arsenal’s new away kits for 2015-16 season are manufactured in blue and golden combination that match the whole design of kit. That’s all about the new away kits of Arsenal for season 2015-16. How much you like new home jersey of Arsenal. Did it meet your expectations? Share your reviews on the comment box below.